Things are going just fine and then, out of nowhere, a perfectly healthy patch of skin starts to itch… then it gets red… and then suddenly it’s swollen, flaky, and peeling. To make things worse, it’s usually unclear what causes eczema to flare up, and unless you use some serious medication, it’s unclear how to make it go away. But what if I told you that essential oils can help you treat the symptoms of eczema, and bring your skin back to normal in record time? And what if you could go even a step further, and use essential oils to eliminate some common eczema triggers altogether? It’s quite possible, and there’s even a lot of scientific research to back it up. Read on for specific recipes and instructions. Let’s go over a couple of terms first, just to make sure we’re on the same page. Eczema and dermatitis are just different names for the same condition, a form of skin inflammation. And they really just refer to the symptoms — the red, itchy, peeling skin, which can occur anywhere on the body. The fact is, eczema (AKA dermatitis) can be caused or made worse by many different factors, and that’s one of the main reasons it can be so difficult to treat. What works on one person won’t necessarily work for another, and that’s why the rest of this article will cover several different ways that essential oils can help with eczema. Which essential oils actually help with eczema? Here’s a quick summary of the research that backs this up. First, a study on skin inflammation in mice found that geranium essential oil had a big and positive effect, beating out lavender, eucalyptus, and tea tree essential oils. But tea tree oil is no slouch when it comes to reducing skin inflammation. In a study involving 27 volunteers, tea tree oil significantly decreased skin flare-ups following an injection of histamine. Placebo had no effect. Third, we’ve got rosemary and chamomile essential oils, which aromatherapists frequently recommended for skin inflammation and irritation. I dug around to see what research I could find to back this up. When it comes to chamomile oil, I didn’t find any research about its use for skin inflammation specifically. However, there are enough studies about the various anti-inflammatory effects of chamomile essential oil as a whole, as well as its main compounds, to give it a shot for eczema. As for rosemary, I found a study that shows rosemary extracts are in fact anti-inflammatory, but this was mainly due to compounds not found in rosemary essential oil. Still, as you’ll see below, there are good reasons to use rosemary essential oil on your skin if you experience eczema, even if the oil is not reducing the inflammation directly. What about other essential oils? The one research paper I found that deals directly with essential oils and eczema examined lavender oil. However, the researchers found that a massage with lavender oil was no more helpful in reducing eczema than massage alone (though massage was better than placebo). Also, you might have seen frankincense essential oil frequently recommended on aromatherapy sites both for skin conditions and for inflammation. I did find lots of research to back up use of frankincense extract for inflammation. The trouble is, frankincense extract is a completely different product from frankincense essential oil. In particular, frankincense essential oil doesn’t contain the compounds (known as Boswellic acids) that appear to be responsible for the anti-inflammatory action of frankincense extract. You can also use any other oil as a carrier instead of evening primrose. However, as you can read further on in this article, it appears evening primrose oil might have added benefits for eczema-prone skin. By the way, if you are new to essential oils and you’re looking for more detailed instructions on making these blends, check out our complete guide to diluting essential oils. Whether you’re using a single diluted oil or a blend, you can simply apply a light layer over the inflamed skin. And since these dilutions are all gentle, you can apply the oils several times a day, as needed. If you don’t see any significant improvement within that time, try another one of the oils above. 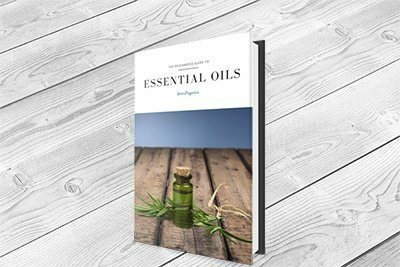 Robert Tisserand is probably the best-known authority on essential oils and their uses for health, as well as for skin care. I couldn’t find anything specifically that Robert has written on the topic of essential oils and eczema. However, I did find a kid-friendly skincare blend that Robert has designed for Plant Therapy. However, if you look through the many positive reviews, it becomes clear this is primarily sold as an anti-eczema blend, as its previous name “Eczema Helper” shows. You can use this blend in the same way as the recipes above: simply apply it directly to the inflamed skin, several times throughout the day, for a few days until the inflammation disappears. By now, you have several essential oil recipes try and treat eczema once it appears. But why treat symptoms if you can treat the cause? Like I mentioned above, lots of things can trigger eczema. And one of these eczema triggers is various allergies. Now, as we’ve written before, essential oils can be a big help with allergies and their symptoms. We even included an EO recipes specifically for treating allergy-caused skin inflammation. But that’s not all. Recent research points to everyday, common dust mites (little microorganisms that live all around us) as the nasty and hidden cause of many allergic reactions, including eczema. The good news? Several essential oils can help you get rid of dust mites, or at least drastically cut down their numbers. For example, according to this study, tea tree oil does a great job of eliminating dust mites. And according to a second study, German chamomile, rosemary, and eucalyptus essential oils are all also effective in killing little mites. You can diffuse any of these oils at home in your home diffuser to reduce mite numbers, and hopefully remove the cause of your eczema. Another very useful option is to add some essential oils when you wash your sheets and bedding. As shown in this study, a 0.2% dilution of eucalyptus oil used as a pre-soak for some mite-infested blankets killed over 99% of mites, while using detergent alone without eucalyptus oil killed less than 3%. By the way, if you balked at that amount of essential oil (100 ml), you’re absolutely right — it’s way more than you would ever use in an aromatherapy application. However, when you mix it with the detergent, it will disperse evenly throughout the large volume of water, and it will form only a 0.2% dilution. Infection can be a cause of eczema, and it can also contribute to making eczema more widespread, slower healing, and generally more of a pain in the backside. Specifically, it seems that the widespread bacteria Staphylococcus aureus, commonly known as “staph”, can trigger the immune system and lead to eczema. As you might expect, killing bacteria, including staph, is an area where essential oils excel. Tea tree, peppermint, and rosemary essential oils have all been shown in scientific studies to do a good job eradicating the staph bacteria, even when used in low concentrations. We’ve seen tea tree and rosemary already on the list of anti-eczema essential oils, and their anti-bacterial effect is all the more reason to use them. You can either use the recipes from the section above, or add a drop or two of either tea tree or rosemary or both to a cream that you use regularly over the area of your skin that’s prone to eczema. Ok, this is the last of these “underlying causes” sections. But it might be the most important. That’s because different types of common fungal infections (such as candida) have been linked to eczema. Here’s the trouble, though. Unlike with bacteria, there are very few commonly used anti-fungal agents, unless you’re looking for serious prescription medication. Essential oils are an exception. Various essential oils have been shown to be effective at killing harmful funguses, including those that lead to eczema. The thing is, many of those anti-fungal essential oils, such as cinnamon and oregano, are not appropriate for topical use except in very, very dilute amounts. However, there is one essential oil that’s both skin-safe and very good at killing funguses. It’s our old friend, tea tree oil, which we’ve listed in just about every section of this article. In short, if you suspect your eczema is caused by a fungal infection, trying out the recipes we’ve listed above which include tea tree oil is a must. There’s one last recommendation I’ve come across and want to share. It has to do with evening primrose oil — a carrier oil that you can use to dilute essential oils. Evening primrose oil is high in a substance called gamma-Linoleic acid (GLA), a fatty acid that’s also found in other oils such as borage oil and hemp oil. GLA is something that our bodies normally produce, but there is some evidence that some people don’t produce sufficient levels of GLA, and this can lead to eczema. Several studies looked at supplementing with evening primrose or other GLA-containing oils, and found that it lead to significant improvements in eczema symptoms. Most of these studies looked at ingesting evening primrose oil. A good way to do this is to get evening primrose capsules, which are probably easier to swallow than two or three tablespoons of evening primrose oil straight out of the bottle. Also, while I haven’t found any research on the topic, I think it’s worth giving evening primrose oil a shot as a unique carrier oil for eczema applications (that’s why I included it in the recipes above). Eczema can be a very frustrating condition, both because of the unpleasant and unsightly symptoms, and because it is often unclear what causes it to appear. Essential oils can help you treat eczema symptoms, and they might even be able to eliminate common causes of eczema so you can completely eliminate new flare-ups. Which essential oil recipes have worked to help you treat eczema? Let me know in the comments below. You may be allergic to the metal on your glasses. Roman chamomile works much better on my eczema than German chamomile, so that might be one to consider as well. That’s great to hear! Roman chamomile is one of my favorites and a worthy add. When we update this post, we’ll be sure to include it. Thanks, Helena! My husband has diabetes, his bottom legs break out in a red blistering rash. Din’t Know if they consider it eczema, they prescribed a steroid cream, but doesn’t do much to help clear up his problem. Would there be any essential oil blend that you would recommend? There are some recommendations here for eczema that may be helpful. Alternatively, you can try a visit to an aromatherapist or herbalist in your area. Sorry I can’t be of more help on this specific issue.